My personal gmail account is unusable. I wade through the sludge occasionally, but mostly, it’s a lost cause. I really want to try Inbox, but since it’s not available for GAFE accounts, I’m not ready to make the change only to have to go back and forth between old and new. Needless to say, I have been searching for an Inbox Zero solution almost since I started using gmail. To date, I’ve tried filters and labels, I’ve tried different apps, Sortd being the latest but I’ve never found a solution that worked across desktop and mobile with a simple workflow that didn’t require a lot of effort. Many solutions try to make the Inbox more than email and while the allure of a task list or file cabinet in gmail is strong, at the end of the day, what I really need is a way to make sure I’m staying on top of the demands of my email. I was tired of “losing” email requests for technology, new furniture, help and the like. I even went to far as to switch from iOS to Android to get the native gmail app experience on my phone. It got better, but despite a more native gmail experience, the wall of email continued to threaten to bury me. Enter Principal Todd (who almost certainly gets more email than me and never has a concern in the world about his Inbox) and his “duh, you moron” suggestion to use “Send & Archive” and Stars to manage the deluge. First, per Todd’s instructions, I enabled the “Send & Archive” button in gmail settings. A magical thing this. It means I can archive an email, or conversation, as soon as I’ve replied. If someone replies back, it pops back into the Inbox, but it doesn’t live there, clogging up the pipes (I wish it worked on mobile). Then I went off the reservation a bit and deleted all of the filters and labels I had originally put in place to “manage” the flow of email into my Inbox. I kept the ones that diverted the listerv emails, obviously, but the rest are now toast. I did keep one label, my Needs Action throwback. I use it as a place holder for when I have to take information out of gmail and put it somewhere else. This is one of the places I still struggle a bit. As for stars, I’m still cleaning up from a starring binge period where I starred every email I needed to follow up on (which was like almost all of them). Once I get them cleared out, I think I’m going to use Stars for “send info somewhere else” and I might be able to lose the Needs Action label altogether. For now, they’re the legacy part of this equation. I’m also using a combination of Google Sheets and Docs to track different request. Information that comes in via email and needs a place to go ends up there. Thanks to Joe Ayala, we’ve also started using Slack with the team, and I now find myself relegating ToDo’s for my team which require action to Slack rather than email, because the message is visible to all and can be “checked off” when completed. It took me a bit of time to figure out the relationship between email, slack and google docs, but it’s starting to coalesce nicely. Every day this week I hit Inbox Zero and as of now, I spent about 5 minutes clearing the 10 Needs Action emails out which were just waiting for me to put their information elsewhere (down to only two!). This whole process has been a lot of work and I definitely over did it with trying to keep up (I felt like I was in email constantly). With school out now, the flow should go down and I’ll have some time to tweak things. I’m considering setting up a few daily “desktop” email times where I go through the batch, rather than constantly trying to react in real time. I’m still able to reply to the important stuff on Mobile and archive where needed, but it’s not as efficient as via the web. I’d really like the “Send & Archive” option on the mobile gmail app. That would make the circle complete but for now, I found Inbox Zero without third party add ons are apps. Yay! Ever thought of using Googles Multiple Inboxes in Labs? Worth a Google search – Doesnt help with mobile device workflow I am afraid. Defo set desktop time, worked for me, make email work for you, not the otherway round! The 9.7″ iPad Pro arrived this week and I think the picture says it all. The ink experience on this thing is amazing. I’m an old college rule notebook note taker, and in the modern laptop era, I never really made the switch to typing notes because I like to doodle. Enter the iPad Pro 12.9 and a glimmer of hope, but at 1.5lbs, not the feather weight daily carry I was hoping for. At just under 1lbs, the 9.7″ iPad Pro has solved that particular issue. The 9.7″ iPad Pro is fast and when paired with the Pencil, it’s a doodling note takers dream. It’s also an amazing tablet for art, as my kids have quickly discovered. When I bring it home, they instantly grab it and intuitively start being creative. Finger, shminger, we’re made to use tools and the Apple Pencil is so responsive, it might as well be laying down graphite on the screen. That’s not to say everything is perfect. I’ve noticed little things that show how Apple isn’t quite putting the same thoughtfulness into end user experience that it used to. The way you’re supposed to charge the Pencil by plugging it into the iPad is ridiculous. I mean, seriously, it looks lame sticking out the bottom of the iPad and you can’t really use the iPad while the Pencil is charging like that. Alternatively, their is the little adapter that comes with the Pencil that you can use to charge it from a regular lightning cable but can you say, going to lose it in the first 5 minutes? The cap on the Pencil’s lightening port rattles ever so slightly, as if someone left a few too many decimal places on the tolerances for the slot. But the biggest issue with the Pencil is storing it with the iPad. Absent a case with a loop option or a magnetic attraction docking scenario, the Pencil feels like an add on to the iPad as an experience. I’m also looking for a case with a hand loop that will make the iPad comfortable to hold one handed while using the Pencil. Pressing down with the Pencil and holding it one handed is a bit awkward on a naked iPad. Having said that, the Pencil/iPad Pro technology is a home run. 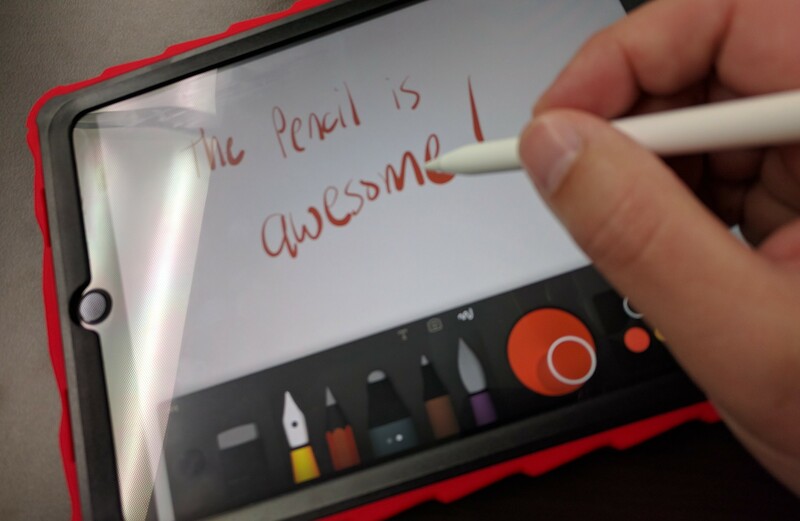 Now if only Apple would make an iPad/Pencil combo for $350 and convince SBAC to develop a tablet friendly version of their online assessments, they’d have a real shot at taking on the Chromebook in the classroom. For now, the iPad Pro is going to be relegated to piloting with our Teacher Leaders and in specific graphic intensive programs (STEAM!). As a general purpose learning platform, it’s too expensive and the parts just aren’t integrated together well enough to survive the classroom. Using this configuration, we leave the AirTest app available all year round. That means we typically only have to worry about managing the OS version upgrades during testing. This is a great, low impact option for us because it means our Chromebooks aren’t bricks sitting in carts when testing isn’t taking place in the classroom during the testing window and we don’t have to move Chromebooks in and out of OUs to enable public sessions or kiosk modes to “prepare” for testing. We can spend our time making sure the Chromebooks are updated to the right OS version, hold a charge and don’t have broken parts so we’re good to go on the first day of testing. If this sounds like the route you’d like to take, read up on Scenario 1 from this Google Support page. It’s pretty straight forward. When students power on the Chromebook, they will be prompted with the option to login to their GAFE account and get to work or they can open the app launcher (which needs some management features please, but that’s a topic for another post) and select the AirSecure Browser, which will magically launch as a Kiosk App, no login required. Best of both worlds, just like a peanut butter cup.